Jonagold is a popular American apple variety with an excellent rich aromatic flavor which appeals to European tastes - and is widely-grown in Europe. Jonagold stores well, a quality it inherits from one of its parents, Golden Delicious. 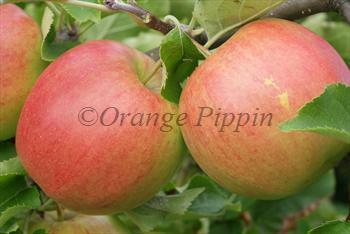 However it gets its excellent flavour from its other parent, the very well-respected old New York apple variety Jonathan. It has the combination of good sweetness and good sharpness that often denotes a high quality apple. Jonagold is a very versatile apple. As well as being excellent for eating fresh, it is a popular for all kinds of culinary uses, and good for juice and cider. The apples can be picked over several weeks - pick earlier if you want to store them. Red Jonaprince® is a sport of Jonagold with a much deeper red colouring but the same flavour. Please fill in the details below and we will let you know when Jonagold apple trees are back in stock. Jonagold is in flowering group 4. Jonagold is a triploid variety and cannot pollinate other varieties. It needs to be pollinated by another tree of a different variety nearby. You can either plant a self-fertile variety (which will pollinate itself and the Jonagold) or you can plant two pollination partners which must each be of different varieties and able to cross-pollinate each other as well as the Jonagold. If you need further advice on this just get in touch. The main horticultural issue is that Jonagold is a triploid apple variety and therefore needs two separate pollination partners nearby (or one self-fertile one). If you have apple trees in neighbouring gardens, they may be suitable. Golden Delicious is a reliable pollinator of many apple varieties but Jonagold is an exception and cannot be pollinated by Golden Delicious. 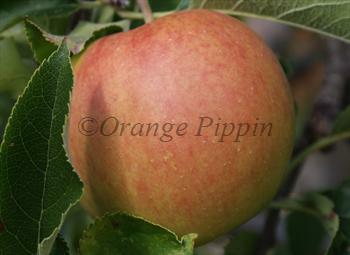 Like most triploid apple varieties, Jonagold produces a fairly large tree and the apples are also fairly large. Cropping is generally good and there is no need to thin the fruit. Jonagold is susceptible to a number of apple diseases, but its vigorous triploid nature seems to help it keep going. Jonagold likes a warmer climate but can be grown across quite a wide climate range - including the cooler climates of northern Europe where it is grown commercially on a small scale. Jonagold is a cross between two classic American apple varieties, Golden Delicious and Jonathan. Developed by the famous Geneva research station in New York State in 1943. As with many commercial apple varieties, a number of "sports" or clones have been discovered over the years. These are natural bud mutations arising in the orchard, which have been spotted by a keen-eyed orchard owner and then propagated because of their commercial value. Red Jonaprince® is one of the best known, and as with most sports the main difference is the stronger red colouration and tendency to produce larger fruits, which are considered desirable by consumers. Genetically the sports are identical to the original variety (and like Jonagold they are all triploid).